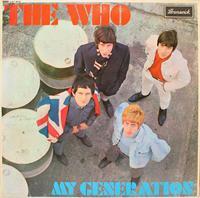 Unfortunately I didn't get the original UK-version, but the US-release "The Who Sings My Generation" which differs in the tracklisting (and has a clearly much worse cover), but I think it's a fair representation. If it wasn't for on thing this album might have gone the way of a lot of the unknowns did, cause mostly this is popped up rhythm and blues. The only inkling that there's something else going on comes in at 1:40 into the first track, Out In The Street, where suddenly it sounds as if someone stumbles over the guitar. The mind goes "wait? what?" for a second, but then the bit of controlled noise is gone. The only track they fail on is James Brown's Please, Please, Please, which sounds just like the worst possible outcome of four white Britons covering the hardest working man in show-biz. But still: way better than when they finally sold out.